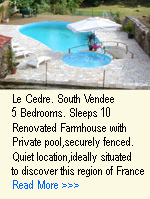 Website Link; If you have a website related to the Vendée you can have a link from just £10 per year, where ever your site is mentioned that link will be live, so if you are a campsite you may have a mention on 3 or 4 different pages as a result of the information we make freely available to our viewers, the fee of £10 covers all these inclusions. If your entrepise is not mentioned on our general information then we will add it to any appropriate page with a brief discription. 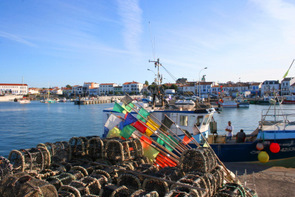 Property Adverts; you can advertise your property on the Vendee Guide from just £50 per year. This will include an entry on every section that your property qualifies for; eg., if you have a 2 bedroom gite with a swimming pool on the Marais Poitevin, it will be entered into the general section and into the 2 bedroom gites page, 2 bedroom gites with pools page and accommodation on the Marais Poitevin page. There will be a link to a page with full details including 4 photos and a link to your own website if you have one. Featured Property advert. This costs £100 per year; You get all of the above plus your property will be displayed in a prominent position on the right hand side of the accommodation pages and on other related pages, including the nearest town page. Services. Adverts for restaurants, bars, Campsite, Hotel, attractions and activities can be displayed as a banner on the appropriate pages from £50,(160px wide by 200px high) £100 (600px wide by 100px high) For larger adverts and other services please contact us to discuss your requirements.